Welcome to my southern comets web site. Here you will find images and photos of past comets visible from the southern hemisphere, plus other observations of interest. PLEASE NOTE: There will be no further updates to this webpage. which includes currently observable comets. Web Page last updated on 10-Sep-2011. Members of the general public should read these astronomical and comet definitions , essential observing tips , and how to do simple comet photography. Canon 300D digital camera and 300mm zoom lens cropped. ISO 100.
combined 2x1 second exposures. Unsharp mask processing. Note the intricate detail in the coronal filaments, marking the magnetic field lines of the Sun. You can also see subtle detail on the lunar surface. The Magnitude 4.0 star delta Cancri can be seen to the lower right. Exposure times from left to right. 1sec, 1/200, 1/200. Taken near Bulgan gol in western Mongolia. 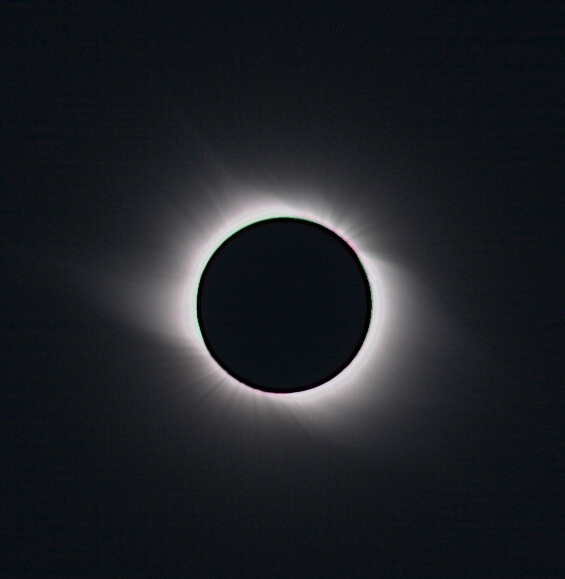 Unsharp masking to reveal detail in the corona. You are visitor number since June 20th 2003.